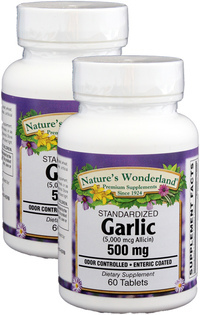 Garlic Standardized - 500 mg, 60 tablets each (Nature's Wonderland) - Penn Herb Co. Ltd.
Garlic has been used therapeutically in many cultures for thousands of years. With its high concentration of sulfur-containing compounds, Garlic has consistently demonstrated an ability to support immune function, cardiovascular health and provide antioxidant protection. Many of Garlic's biological effects are thought to be related to allicin and other related compounds. Nature's Wonderland standardized Garlic powder is equal to 1/2 bulb of fresh garlic and provides 5,000 mcg allicin . Each tablet is enteric coated for odor control and to avoid stomach acid which can cause allicin decomposition. Supports immune function; supports cardiovascular health; provides antioxidant protection. As a dietary supplement, adults take 1 tablet with meals, or as directed by a health care professional.